Dosa Factory serves up easy-to-eat Indian food in the rear of Shalimar Gourmet Foods and Spices market in Central Square. 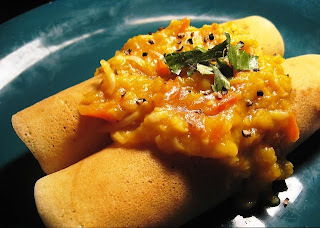 Dosas are South Indian crepes made from rice and black lentils. Popular street fare on the subcontinent, they’re filled with vegetables and meat. They’re easily 18 inches long and dangle off the plates. The masala dosa is great for vegetarians, stuffed with a chunky mash of curry-spiced potatoes and onions. It packs a lingering heat. The chicken tikka dosa is more subtle and simpler, with juicy tandoori chicken and roasted onions. All dosas are accompanied by sliced raw red onion, spicy sambhar, curried lentil soup and coconut chutney. The menu also offers an assortment of Indian faves including tandooris, vindaloos and kormas. And Indian desserts - such as gulab jamun, dense and moist dough balls oozing with ultra-sweet, rose-flavored syrup. Place your order at the counter and dine at one of the half dozen booths. Dosa Factory is popular for takeout - it was packed when we were there. Dosa Factory, 571 Massachusetts Ave., Cambridge; 617-868-3672. Less than $20.